In eighth pAsuram – AzhwAr says “Though I have no means to attain you, I am crying out for you to see you; How am I going to have my desire fulfilled?”. Subsequently, AzhwAr meditating upon emperumAn‘s divine qualities, forms and radiance which are a result of his saulabhyam (simplicity of being born as krishNa) says “How can I, who has nothing in me, call out for you to see you?”. Eighth pAsuram. AzhwAr is saying “How can I, who has no qualification matching the result to be attained, call out and attain the goal, like those who are engaged in certain means/process to attain a result would call out if their results are delayed?”. pAvu thol sIrk kaNNA en paranjudarE! kUvuginREn kANbAn engu eydhak kUvuvanE? param sudarE – oh one who is having infinitely radiant form! kUvuvan – will I call? 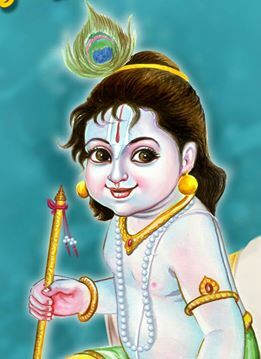 I did not give up (by engaging in thapa (penance), gyAna (knowledge), sama (good qualities) etc) sins that cause inseparable sorrows; I did not constantly worship (as said in thiruvAimozhi 1.3.5 “vaNakkudaith thavaneRi”) your (the apt you) divine feet; Oh one who is having infinitely radiant form which triggers my desires, by being krishNa with natural qualities (for protection [of his devotees]) that have pervaded (everywhere)! I am crying out (like those who engaged in various processes and called out for you since you did not appear even after such efforts) to see you; where will I call to reach you? mEvu – Sins that cause inseparable sorrows for the AthmA as said in SrIranga gadhyam “thilathailavath dhAruvahnivath” (like oil inside sesame seed and fire inside firewood). I did not eliminate such sins by engaging in ordained activities as said in thaiththiriya upanishath “dharmENA pApamapanudhathi” (by engaging in righteous acts, he eliminates the sins). Ovudhal inRi un kazhal vaNangiRRilEn – I did not look out for the means to visualize you by engaging in constant meditation as said in bruhadhAraNya upanishath 4.5 “nidhidhyAsithvya:” (to be meditated upon). embAr would explain this as “OvudhalinRi mEvu thunba vinaigaLai viduththumilEn” (I did not constantly try to give up sinful activities) and “OvudhalinRi un kazhal vaNangiRRilEn” (I did not constantly try to worship your divine feet). Like a newly wed girl would not even have time for food (she will be constantly pursued by her husband), I lived by feeding my sense organs well and never looked after my well-being. pAvu thol sIrk kaNNA – This being the case, once I meditated upon you, I am unable to leave you. Oh krishNa who is popular for your natural auspicious qualities even in opposing groups as said in SrI rAmAyaNam sundhara kANdam 21.20 “vidhitha:” (SrI rAma is well known as one who is well situated in dharma (specifically SaraNAgathi dharmam) …)! en param sudarE – Oh one who revealed your greatness in all aspects! kaNNA en param sudarE – Also explained as – Oh one who made yourself available as very humble krishNa and let me fully enjoy your beauty! It is said in thiruvAimozhi 6.3.7 “param chudar udambAy” (having radiant form). kUvuginREn kANbAn – Those who engage in specific means [like karma yOga, gyAna yOga, bhakthi yOga etc] and still not attain, will call out for you when their goal is not attained. Similarly I am calling you [without engaging in any such means]. engu eydhak kUvuvanE – Would a mosquito’s call be heard in brahmA’s assembly? How I am going to make you come by my crying out? This entry was posted in thiruvAimozhi, thiruvAimozhi 3rd centum on July 28, 2016 by Sarathy Thothathri.